Words may fail, but a true hug never does. 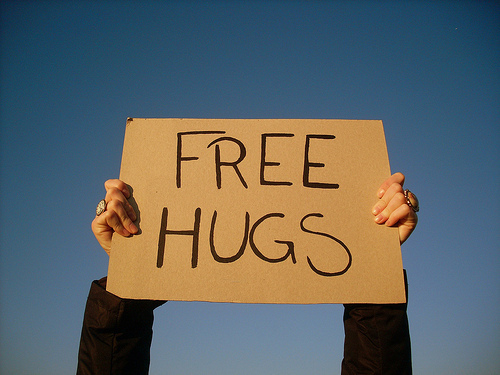 We are a culture disconnected from healthy, loving, healing touch – everything that a heartfelt hug offers. One of the books my daughter loved for me to read to her was a book called Hug, by Jez Alborough. The main character, a chimp named Bobo, searches the jungle with his friends looking for a hug and isn’t happy until he gets one – from his mama. Hugs are of the simplest – and most needed – pleasures in life. Hug a loved one today, a deep, warm enveloping hug that lets them know they occupy a special place in your life. Find reasons to hug loved ones when you can, maybe for no reason at all. Life is short. Hug often. Tags: #24daysofgiving, Advent, affection, devotions, hugs, Love. Bookmark the permalink.